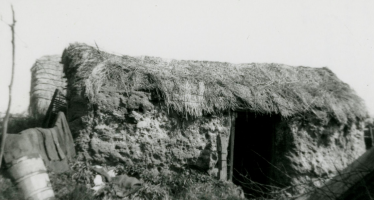 There is an old Manx cottage in Spaldrick, which I wish to choose as a type that has been inhabited in succession by four generations of a very long-lived family (who reached the age of ninety), and is said to be 200 to 250 years old. 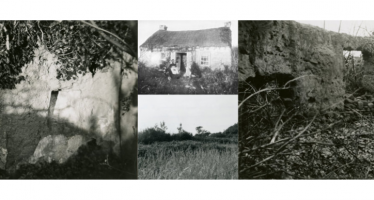 The cottage is 30 feet x 15 x 12, the kitchen (sliamyr aarlee), 18 x 14, the loft (lout),12 x 12; the walls whitewashed, and thatched with straw-ropes (sugganyn), made fast to pieces of stones (bwhid suggane), which jut out from the walls. The thatch is sewed through with briars, then called (goll thoo), when tied merely with ropes alone the name is simply (thoo). Outside there is a little muclagh, or pigsty; the little opening in the outer wall is called the muclagh giark, or hen-roost because formerly the hens used to sit in the muclagh. There is always a little garden in front, for the Manx are very fond of flowers; they generally keep a few useful medicinal herbs ready for cures; the outside of the house or cottage is hung with fish for curing, or has the fishing nets suspending from it; the floor (sole y dorrys) consists of concrete of clay, hardened by age and use, or stone flags (flaggyn). The doorway is just high enough to admit a man, called essyn y dorrys, and the lintel goes by the name of clagh linteyr. You go up the loft (pronounced laf or lout) by a few steps (greeishyn irree seose yn lout), which is used for a bedroom. The rafters of the roof, or cass cubbyl or rafters ny thie, consist of a couple of feet, A shaped, hence the name. Under the thatch you have the scaghyn yn thie, or scregs, which are sods of turf, rolled up, two inches thick, and laid under the thatch. The parlour or cuillee is on the left side, and often serves as a bedroom for the parents. It means toe back of the room. The windows are mostly two, and so small that they scarcely admit any light. The door is generally open, and often consists of an upper and lower part, the latter with a wooden latch to open. Coming to the fire-place (chiollagh) — the fireside is keeil-chiollee — you always have the pot with lugs over the fire, suspended on the drolloos (pot hooks) from a chain, the slouree (“cur er y slouryn“). For resting your self you have the settle with straight backs and handles on, and the stool (stoyl), for a table, the form or boayrd, the chairs proper (stoyl ghrommey) pronounced “cheers“; for their linen and things they have the chesses (koir or kishtey). 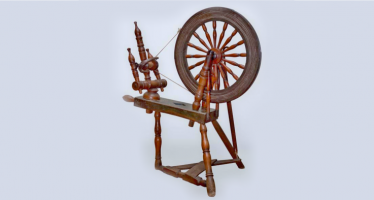 In some of the cots (cottages) you still see the spinning-wheel at work, and the women make jerseys for the fishermen. The price of a spinning-wheel was given to me as 19s. ; for making a jersey you require 3 lbs. of wool, price 1s. 3d. per lb. ; carding, 3d. ; spinning, 7d. ; dyeing, 10d. per lb. each; total, 9s., so that, including 4s. for knitting, one jersey cost 13s. There is also still some hand-loom weaving going on at present in Ballafesson, the cloth they make is so strong and durable that it resists wear and tear for many years. It is dyed in the usual old Manx colours. They used also to make a lot of linen, and among old Manx field-names are some faaie lieenatgh (flax field).